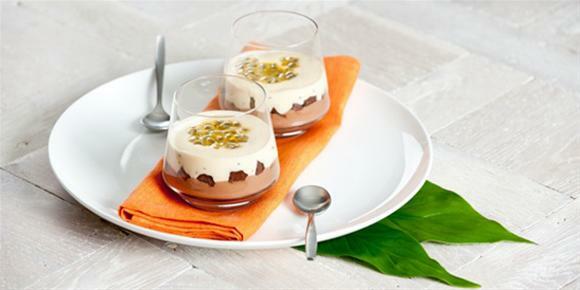 Lindt Master Chocolatier Thomas Schnetzler has created this wonderful chocolate and passionfruit cream layered dessert which is perfect for Valentine’s Day. “This is a true summer delight. The tartness of the passionfruit combines deliciously with the wonderful flavour of this unique chocolate and the luxuriously smooth cream; while the passionfruit seeds and slivers of almond add subtle texture. A verrine is a dessert served in a glass – you can use any shape glass. You can also put your own touch to this recipe by adding a layer of jelly or crushed shortbread,” says Thomas Schnetzler. 180 ml	Passionfruit pulp (sweetened if desired) – approx 12 fresh passionfruit, or buy tins. 180 ml	Passionfruit pulp (sweetened if desired), approx 12 passionfruit or buy tins. 1. Combine the milk, butter, half the sugar and vanilla in a saucepan and bring to the boil. 2. In the meantime whisk remaining sugar, cornflour and egg yolks. 3. Once milk is boiling, pour a small amount into the egg mixture. Stir well and then add the egg mix to the milk and cook until thickened. 4. Divide the custard mixture in two and set aside one half covered in cling film. 1. For the Chocolate Crème, mix the chopped chocolate into the warm custard and stir until dissolved. 2. Mix in the passionfruit pulp and lastly gently fold in the whipped cream. Place in the fridge to cool. Whisk the custard then mix in passionfruit and whipped cream and cool. To assemble: Pipe or spoon the chocolate custard into the base of the glass. Then top with the Passionfruit Crème and decorate with some passionfruit pulp and a little garnish. Note: You can serve this dessert immediately or prepare it the day before. You could also add a layer of chocolate cake/brownie pieces or crushed biscuits for added texture. Buy passionfruit when they are cheap and plentiful and freeze the fruit whole or pulp only in a plastic lock-bag.